Pranav Mukherjee was a famous political leader of Indian national Congress. He is currently president of India. He was born on 11 December, 1935 in a village of Birbhum, West Bengal. His father was Kamada kinker Mukherjee and mother was Rajlakshmi Mukherjee.Kamada kinker Mukherjee was a member of West Bengal Legislative Council. 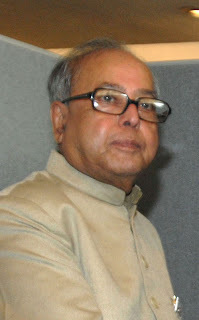 Pranav Mukherjee married to Subhra Mukherjee. They have three children - Sharmistha,Abhijeet, Indrajeet. He was a student of Suri Vidyasagar College. He has a M.A degree in Political Science. He also have degrees in history and law. Before entering in politics, he worked as a upper-division clerk in the office of Deputy Accountant General. He also worked as a teacher at Vidyasagar college and as a journalist for "Desher Dak ". His political carrer started when Indira Gandhi recruited him for the Indian National Congress. He became a member of Rajya Shabha in 1969. In a few years after joining Congress, he became a powerful leader of Congress. He was a loyalist of Indira Gandhi. At that time he was the next powerful leader of Congress after Indira Gandhi. But after the death of Indira Gandhi, when Rajiv Gandhi was selected for the post of prime minister, he resigned Congress and founded Rashtriya Samajwadi Congress. Later in 1989, RSC and Congress merged together. He has played different roles in his political career. But he was mostly known as the union minister of finance ministry. Other posts held by him were minister of revenue and banking, minister of commerce and steel and mine, cabinet minister of external affairs etc. He became a leader in Lok Sabha for the first time in 2004. He won Lok Sabha seat from Jangipur,West Bengal. In 2012,he retired from all the political activities when he was selected as the President of India. He is the 13th President of India.